Refocused: Test Build available for download! Now with screenshots! Expand view Topic review: Refocused: Test Build available for download! Now with screenshots! Re: Refocused: Test Build available for download! Now with screenshots! Indeed, I remain at your service. Rex, I'm still not exactly clear on what you mean by not being able to get from one platform to another TLITE one, but it occurs to me I neglected to mention that the "jumps" (as they were in vanilla Doom) require a lot of precision in lining up so that you are directly facing the next platform (effectively exactly facing east, for example), and then getting a lot of momentum from a running start. Perhaps that's what I was missing (the precision "jumping"), although it always seemed to me that the overhead TLITE ceilings were blocking me. I'll try the jumps again. 4. I've been altering and experimenting with the final area, but ultimately I'm thinking it will have to go, and be replaced with something that is less of an "arena" and has significantly less things and monsters, for the sake of keeping this map vanilla Doom friendly. 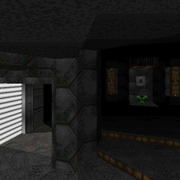 Vanilla Doom compatibility is something that is probably far too important for me in many of my projects, but I only really like to design maps for vanilla and boom compatibility, with a few exceptions. I agree that you ought to strive for 100% vanilla compatibility, if that is one of the central tenets of your game design. (As you might know, I have created multiple map-sets with 100% vanilla compatibility.) As for the final battle, I really liked it, and I think you ought to keep it, with a few changes. Introducing arch-viles at the end will unnecessarily increase the thing count, so this seems to be the obvious choice to ditch. You could provide armor & ammo & health before the final battle, or have a lowering pillar to provide these during the battle. One way to reduce the thing count for health & armor is to give a megasphere, which would probably be greatly appreciated by the average player (like me). Hello again Rex and others who may be into this thread and the map it pertains to. Sorry it has been a lot longer than expected since any news. I've been mostly working on my multitudes of other Doom projects (The project I am secretive about that was formerly called Abhorrence and many others) and being my usual clusterf**k self in many other efforts and endeavors. However, I have a little bit of news regarding tweaks and such that I have been making to Refocused. Rex, I'm not sure if you still are available or into play-testing and providing feedback, and I greatly appreciate all your thoughts from before, but unfortunately I do not have another Test Build yet. 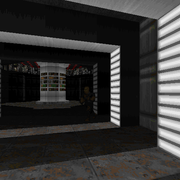 I want to get the next Test Build as close to a release candidate as I can, and the main hurtle is that I've basically, in my sessions in Doom Builder and test-running, realized that the ending part of the map is just too ambitious and has too many things (leading to save game buffer overflows) for vanilla Doom compatibility. I really want to keep what I've already built, but even more I am very stubborn about letting go of vanilla compatibility and just allowing it to be limit removing. I think I can very likely use the concept for the final boss battle area for another project I am working on, or copy and paste it over altogether, and I have some alternative ideas for Refocused. Stay tuned on that front, and for a new build. 1. I changed a lot of the stim packs and smaller ammo things into med kits and bigger ammo boxes, etc. and added some ammo/health (though not enough yet, due to the savegame buffer overflows) to the hellish lava area with the three Barons. 2. I raised the height of the ceilings on the platforms (with TLITE) in the mud, and they can now easily be jumped onto from the rooms above. Rex, I'm still not exactly clear on what you mean by not being able to get from one platform to another TLITE one, but it occurs to me I neglected to mention that the "jumps" (as they were in vanilla Doom) require a lot of precision in lining up so that you are directly facing the next platform (effectively exactly facing east, for example), and then getting a lot of momentum from a running start. 3. I replaced the partially completed piece of music that had a marching drum, tubular bells etc. 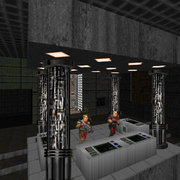 I borrowed the music from Final Doom TNT: Evilution's Map04: Wormhole. It seems to fit the map better. I also may try to make a different sky texture to replace the current starry, dusty brown texture that reminds me a little of the game Dead Space. I like the current sky, but it's a little lacking in the 'professionalism' department, if designing 256-color palette textures for use in a game that was released in 1994 can be considered professional Anyway, it's a little crude IMO. 5. Again, sorry for the long delay and my neglecting this thread. I am actually going to get a little work done on the map right now. Stay tuned. 3. I replaced the partially completed piece of music that had a marching drum, tubular bells etc. 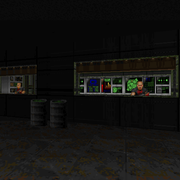 I borrowed the music from Final Doom TNT: Evilution's Map04: Wormhole. It seems to fit the map better. I also may try to make a different sky texture to replace the current starry, dusty brown texture that reminds me a little of the game Dead Space. I like the current sky, but it's a little lacking in the 'professionalism' department, if designing 256-color palette textures for use in a game that was released in 1994 can be considered professional :) Anyway, it's a little crude IMO. Overall would you say that it generally needs less monsters and more health? The number of monsters is fine. Instead of medikits you can use medipaks to give more health without increasing the number of things (and running up against the DooM limits). The same with the ammo. I would suggest you place additional ammo right before the player is expected to meet some tougher resistance - barons, hell knights, arachnotrons. I liked that your secrets were visible but not readily accessible. However, I did not find any clues to the secrets, and ended up only finding a couple. In general, you should use secrets to reward a player for exploration, but not make them necessary for progress. In other words, the player should not have to rely on secrets for required health & ammo. About the platforms in the slime, I was unable to run from one platform to the next if the next platform had the TLITE ledge above. In other words, I was always blocked by the ledge and always fell into the slime. Raising the height of the TLITE ledges will definitely help, unless you were aiming for something different. The final boss fight and secondary fight would be fine if there was more health & armor going in, or available mid-fight. I would definitely NOT dispense with those fights, as they are exciting and challenging. I would simply suggest that you give the player an opportunity to recharge before or during the boss battle & after-battle. Thank you so much for playing and revisiting my map so extensively! It sounds like I really put you through the mill with this one, heh, but I'm glad you like it overall. 1. I will definitely add some more ammo and health. I think I may have placed a lot less than needed because I was running into a savegame buffer overflow due to there being too many Things in the map. Overall would you say that it generally needs less monsters and more health? 2. I will place more ammo and items throughout the hellish area with the 3 barons, especially where the 3 barons are. 3. I placed a lot of radiation suits in the muddy area with the platforms and yellow key to encourage exploration and aid in finding the secret area there. Maybe I should post a list that describes how to get to the secret areas of the map. Many of them are perhaps too hard to find for most players. I think I tend to over do secret areas in that respect. I've always had difficulty balancing making them clever while not being overly hard to find. I also have a tendency when mapping to make the gameplay too reliant on finding the secrets. 4. I knew from the get go that the platforms-in-slime-area was going to be a bit frustrating. I don't fully understand what you are saying about the overhead ledges blocking your ability to get onto some of the platforms. Do you mean dropping down from the windows from the rooms above? Maybe I should raise the ceilings on the platforms that don't move and that have TLIGHT above them, and also make all linedefs tagged and with the lift action for all platforms that do move. 5. I totally overdid the final boss fight, heheh. I'm wondering if I should simply scrap the final area and make the exit in the room past the revenants and chaingunners that lower down from the windows (with the CRACKLE textures and pit). But just as I was typing this I got a fresh idea that is less of a slog gameplay-wise and may work well. Again, thank you for all the feedback and play-testing! I will resume work on this map when I get back from Christmas vacation. Have an awesome Christmas Rex! And likewise to anyone reading this who celebrates: Happy Holidays! I will try to play the boss battle again, but this time with the exit door opened. Let's see if the fight is more fun. I tried it this way, but the 2 archviles are wild cards that make the entire scenario very unpredictable. Once again, I found myself with very little health and my armor in tatters. I have to admit that it gets the adrenaline going, but I wore my finger out hitting the reload-saved-game button. I played the end battle again, using a saved game. Although my comments about the role of luck still stand, I was able to fare better after a few attempts. But the fight after the boss battle was (to me, at least) completely gratuitous, and very frustrating. There is no armor that's offered in that area, and I used up the meager health that was available when I first entered (I had 45% health and 75% armor at the start of the boss battle). If you were to give the player full armor and more health after the boss battle (i.e., the switch opening the door to the exit), the fight might have been more fun. 1. It is a nice nod to MAP04, as you probably intended. 2. There's a very nice mix of themes. When I first saw your screenshots, I thought it would be a challenge to pull off so many different themes, but I feel you've managed it well. 3. I love the complexity of the map design, with its intricate and intersecting pathways. Some people complain when they have to use the auto-map to navigate through a map, but I believe that the mod author should not be leading the player by the nose. 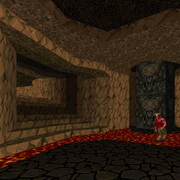 In particular, the first time a map is played, the player ought to spend some time becoming familiar with the layout of the map and the challenges. Many players feel they ought to be able to play a map at UV and beat the map in the first attempt with no save-games and max kills. I disagree, and I feel that the player ought to occasionally refer to the auto-map for guidance. 4. I like the steady ramp up of difficulty. 5. Given that this is intended for vanilla DooM, the architecture is nicely detailed and appealing. 6. The texturing and texture alignment are good, and I noticed only one instance of misalignment (although I wan't looking very hard). 8. The traps are clever. 1. There were times when I was utterly out of ammo, and quite low on health. In one instance, I had to tackle an arachnotron (near the yellow-key bars) with just a chainsaw and 16% health. 2. The ammo distribution created an unnecessary challenge at times. For instance, the area with the secret invulnerability on the ledge and the 3 barons had absolutely no ammo. And this was coming after a fight with numerous Hell Knights, a few barons, a cacodemon, and an assortment of the weaker enemies, followed by 2 archviles. I had to restart from a saved game and skip the 3-baron fight for later. 3. The distribution of some of the powerups puzzled me. For instance, there was a liberal sprinkling of radiation suits in one area, but I didn't need that many (particularly as a couple of them were in lave dead-ends that didn't reward me with anything besides the rad suits). 4. There's an area with platforms in slime, and some of the platforms serve as lifts. Running from one platform to the next works on some, but in a couple of instances the overhead ledges block your access to the ledges. The only way, it seems, to reach those platforms is to step into the slime (bad idea when you're low on health, which I was for most of the time), lower the lift behind you, and when it is rising you time your run just right to get on the "fixed" platform. This was very frustrating for me, and I ended up just using GZDooM to jump onto the fixed platforms. 5. I did not like the final fight, as it relies just too much on luck. If you come up near a Mastermind before the infighting has begun, you're toast almost immediately. I intend to play the map again, having learnt some of the tricks, and see if I can do better. Overall, however, I must say that this is an ambitious and well-executed effort. 2. The ammo distribution created an unnecessary challenge at times. For instance, the area with the secret invulnerability on the ledge and the 3 barons had [u]absolutely[/u] no ammo. And this was coming after a fight with numerous Hell Knights, a few barons, a cacodemon, and an assortment of the weaker enemies, followed by 2 archviles. I had to restart from a saved game and skip the 3-baron fight for later. Re: Refocused: Test Build available for download! Hey Rex! Good to be in touch again, and sorry for my long absence from DRD Team and the Persecution Complex... Thanks for taking an interest in my map! I will try to get some screenshots up soon as well. EDIT: Screenshot links are up on 1st post. 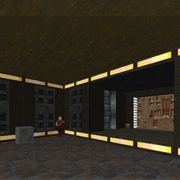 I have here a test build of a remake of sorts of Doom 2's MAP04: The Focus. 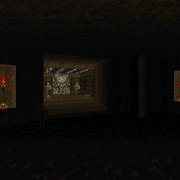 It's for Vanilla Doom 2 and should be fully playable in Single-Player as well as 4 player CO-OP. I put a lot of work into making this map Deathmatch compatible as well, but the layout probably isn't good for that (It's a lot bigger than the original), and I haven't added Deathmatch items as of yet. Not sure if I will because it might make CO-OP too easy having all these extra weapons and items sitting around, and the main emphasis is on SP and CO-OP. It also features a new sky texture and a short piece of MUS music. Anyway, just need some people to test and give feedback before I plan to finalize and upload to /idgames. Let me know of any bugs, especially if there are any problems in Vanilla or Chocolate Doom with the REJECT lump, or if you run into a savegame overflow, though hopefully both of those things should be pretty well worked out at this point. There may be a few minor slime trails. And it's in the MAP01 slot, not MAP04 as might be expected. Enjoy! UPDATE: See the 9th post of this thread for a long overdue but minor update (no new Test Build yet).